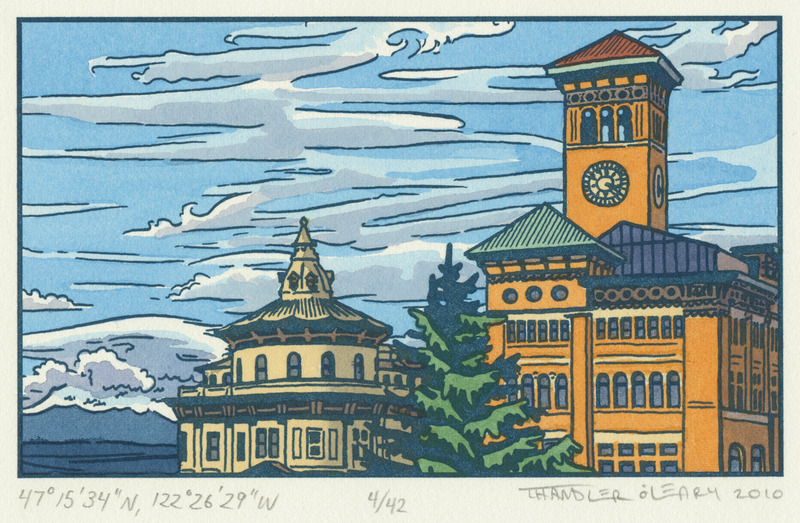 "Old City Hall," letterpress print hand-colored with watercolor by Chandler O'Leary. “For over a decade my constant companion has been my sketchbook, which is filled with graphite, ink and watercolor drawings of the world around me,” says artist Chandler O’Leary. “From nudes to passing strangers, from exotic locales to my own neighborhood, my sketchbooks not only filter my visual notes in a way that informs my studio work, but stand as a documentary of my life.” For outside observers, these notebooks brimming with highly detailed impressions offer the intimate perspective of an artist’s diary. O’Leary is expanding her private journals to the scale of public art with Hillside Sketchbook, a “time-based” installation in which the artist will create a sweeping panorama of Tacoma made up of dozens of smaller sketches of the hillside view. Commissioned by Spaceworks Tacoma, this work will develop gradually over the three-month period it is on exhibition in the Woolworth Building, as O’Leary continually adds ink drawings and watercolors to fill in the vista. "Continuum," O'Leary's graceful, pencil-drawn design for a Tacoma Link Light Rail station shelter was executed on etched glass panels in 2011. "Pike Place," a sketchbook drawing by Chandler O'Leary. O’Leary explains that the organic development of the piece creates a feeling of anticipation for passersby, who may return to the site daily to see what develops. Eventually, the drawings “resolve themselves in a manner that resembles a puzzle coming together until the entire panorama is complete.” After the term of the exhibition is over, the panorama will be taken down, returned to individual sheets, and housed inside a hand-made clamshell box, “like a deck of cards.” There it will neatly exist as an artist book until reassembly at a future date is desired. A graduate of the Rhode Island School of Design, O’Leary is the founder of Anagram Press in Tacoma, and she is noted for her excellence in art, illustration and letterpress design. She was a featured artist at the San Francisco Center for the Book, in 2011; and her work has appeared in 500 Handmade Books: A Celebration of Contemporary Book Forms, a Lark Books publication. Hillside Sketchbook, the Woolworth Building, 11th & Broadway, through June 31, 2012. www.anagram-press.com.